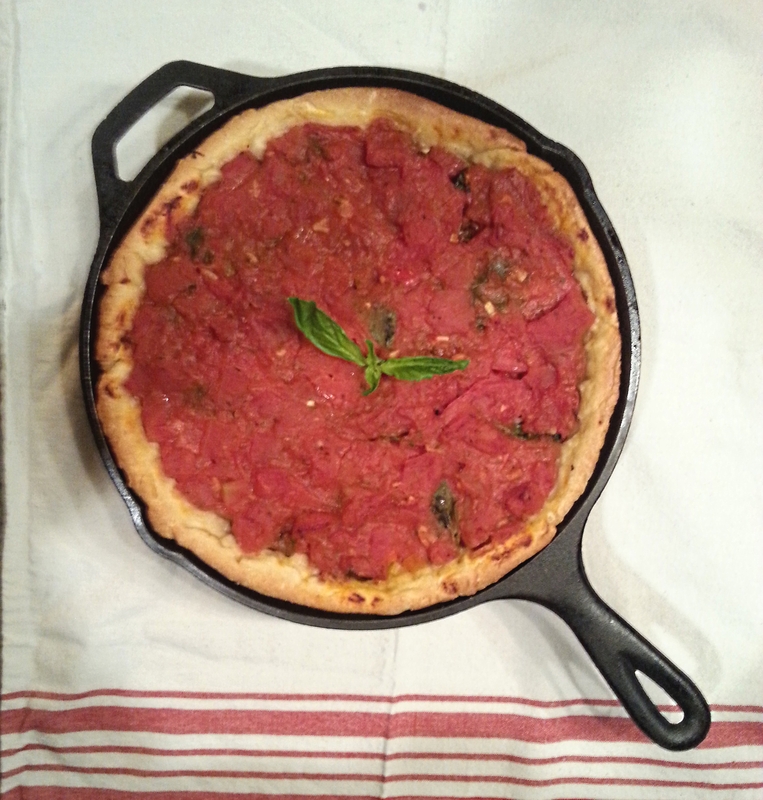 Is there anything more delicious and decadent than deep dish pizza? This pizza is a bit of work, but definitely worth it. This pizza is an adaptation of the America’s Test Kitchen recipe. You make the dough, the sauce, and add plenty of delicious fresh veggies. I sometimes also add veggie pepperoni slices. It’s a great Saturday or Sunday night dinner and leftovers make a great Monday lunch. 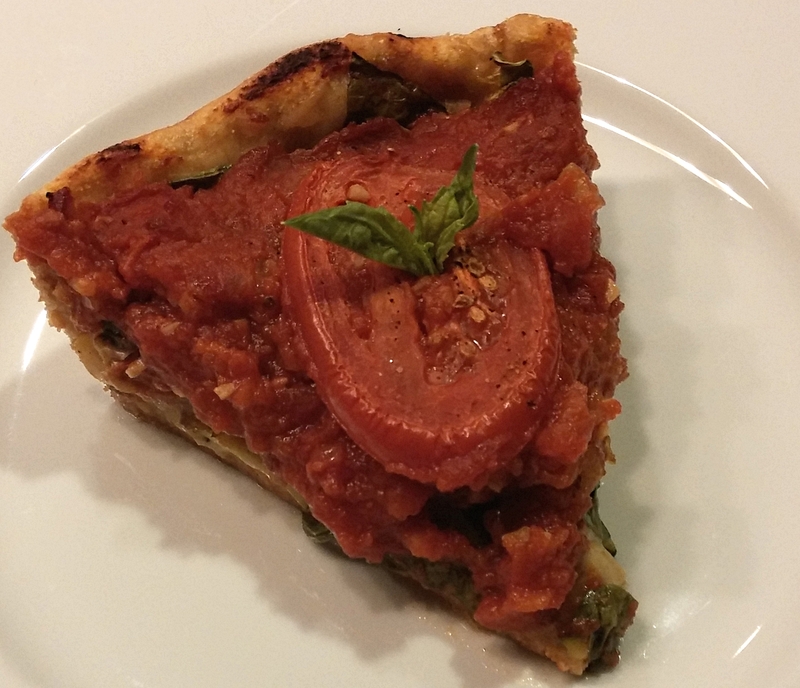 The ultimate deep dish pizza: a buttery crust loaded with veggies and tomato sauce. This can be made vegan by omitting the cheese or substituting a vegan cheese. 1 3/4 cups homemade tomato sauce or jarred pasta sauce. 2 cups assorted vegetable toppings such as: thinly sliced zucchini thinly sliced red onion, thinly sliced bell pepper, fresh spinach, sauteed mushrooms, artichoke hearts, kalamata olives, roasted peppers, pickled hot peppers, fresh basil, etc. Combine flour, cornmeal, yeast and sugar in the bowl of a stand mixer or food processor fitted with dough attachment. Pulse to combine ingredients. Add water and melted margarine and process until a ball of dough is formed, scraping down the sides of the bowl when necessary. Remove ball of dough from mixer or processor and knead for 1 minute by hand, then place dough in an oiled bowl, cover and set in a warm place to rise for 40 minutes to 1 hour. If making your own tomato sauce, prepare that while the dough is rising. When dough has risen, roll it out into a rectangle and spread with softened butter. Fold rectangle of dough into thirds like a business letter, and fold in thirds again. Shape dough into a ball and return to oiled bowl to let rise again for 40 minutes to an hour. While dough is rising for the second time, preheat oven to 425. 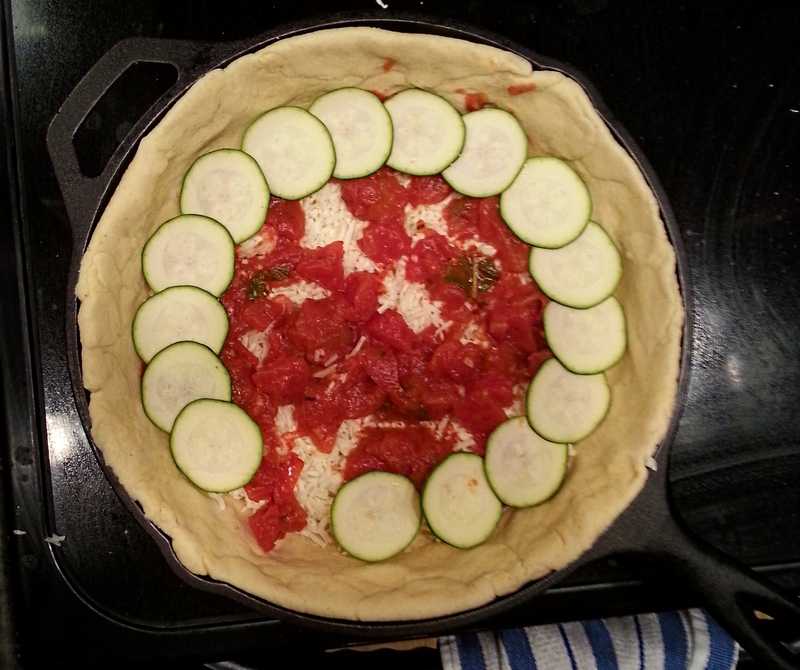 When dough has risen, roll out into circle large enough to line a cast iron skillet or 9 inch round cake pan. Press dough into bottom of pan and up the sides of the pan to form a deep crust. Sprinkle dough with shredded cheese (if using) and top with 3/4 cup of tomato sauce. Arrange vegetables on top of sauce in layers, sprinkling with pepper and salt (omitting salt on the layers of raw vegetables that have already been salted). Top pizza with remaining tomato sauce. Place in oven and cook for 30 minutes until crust is firm and sauce is bubbling. 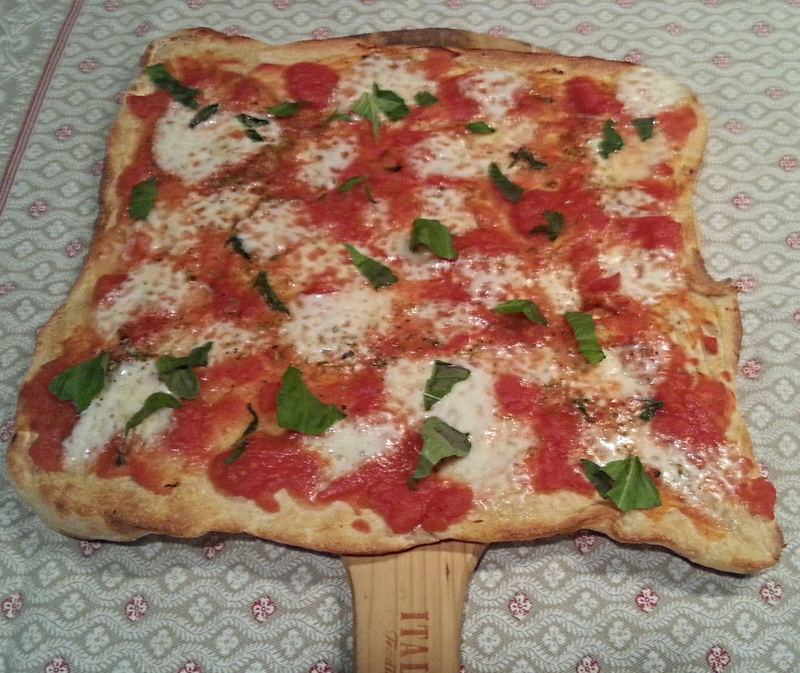 *This step will go a long way toward keeping your pizza from being too watery.